Against a background of general retreat of the labor movement triggered by fears of the absence of better alternatives, workers in the logistics sector have found the strength to reject that fear. That Italy has sunk in a deep economic and political crisis since the spreading of the global recession is by no means a new story. Nor are the effects of the profound reforms of the labor market that have been pushed forward to cut the cost of labor and re-boost economic growth: the precariazation of the labor force through a rise of its flexibility (via a multitude of short-term contracts and the chipping away of the instruments of social protection) is not an Italian story, but a global trend. The crisis of 2008 and the ensuing sovereign-debt crisis that struck the Eurozone have proved legitimate Marxian interpretations of crises as simultaneously the symptoms and the solutions (albeit temporary) to the boom and bust evolutions of capitalism. As David Harvey has pointed out more recently: ‘at the moment of crisis, all the contradictions inherent in the capitalist mode of production are expressed in the form of violent paroxysms which impose “monetary and forcible solutions” and “for a time restore the disturbed equilibrium”’ (Harvey, Limits to Capital, p. 200). Most importantly, once these solutions allow for capital accumulation to start anew, Harvey argues that it often does ‘upon a new social and technological basis’ (Ibid, p. 202). The new social bases upon which economic growth has been restored, in Italy and elsewhere, correspond to a deep reorganization of the relation between capital and labor that has shifted the balance of power in favor of capital. In Italy, the main form this process has taken by now is an aggressive reform of the labor market under the name of Jobs Act. This article will not linger on the details of this labor reform, which we have dealt with in other texts (which are at this time only available in Italian) and in a brilliantly crafted short video, captioned in English. It suffices to say here that the Jobs Act emerges out of a state of downward pressure on wages and working conditions –a consequence of extraordinary levels of unemployment and loss of productivity in the aftermath of the crisis – and it further exacerbates this situation. By claiming to ‘simplify the regime of flexibility of the labor market in Italy [in order to] put the country back on its feet’ (Renzi), the Jobs Act disintegrates historically-acquired forms of workers’ protection, surrendering the workforce to the whims of the employers and of the economy. In this context, workers in Italy have encountered huge obstacles in asserting their own will. The fragmentation of the workforce into a myriad of short-term contracts and the looming threat of unemployment have rendered the workforce relatively docile and prone to share employers’ and politicians’ imperatives of growth, even to the detriment of their lives. We all remember when the FCA CEO Sergio Marchionne threatened the workers first in Pomigliano (Naples) in 2008 and later in Mirafiori (Turin) in 2011 with the closure of the plants and the relocation of production to Poland unless a new agreement was accepted, including the substantial elimination of the right to unionize along with harsher working conditions. Workers found themselves not only fighting for their jobs, but for far worse contracts1 in the spirit of sharing the burden of the crisis and allowing for the company to restore profitability rates. Against a background of general retreat of the labor movement triggered by fears of the absence of better alternatives, the workers of a particular sector have found the strength to reject that fear. For many years now, the logistic sector has been the site of a wave of struggles that have made of this rejection a slogan: “Il facchino paura non ne ha!” (The warehouse worker has no fear!). Since 2008, when picket lines blocked the entrance to the warehouse of the large retail company Bennet in Origgio (VA), the logistics sector (which includes warehouses, shipping and retail companies) has been hit by a round of struggles involving historical Italian firms such as Granarolo and Esselunga, but also multinational companies such as IKEA, TNT and DHL2. In particular, since 2013 the contention has focused on companies’ compliance with the collective agreement signed by the three main confederate unions (CGIL, CISL and UIL). The pact, reflecting this critical moment for the labor movement, provides for a very weak safety net for the workers involved. In addition, the confederate unions did not even bother to monitor the implementation of the agreement at the shopfloor level. The result: in a sector like logistics, even those meager protections provided for by the collective agreement have been neglected time and again, leaving workers in the hands of a system of subcontracting, which completely lacks transparency and instruments of accountability. To be sure, the structure of intermediation between the employer and the employee that results from subcontracting the labor force to external cooperatives3 has allowed for looser legislation and control over working conditions. For most workers, this means forced and unpaid overtime, forged paychecks (or no paycheck at all), and various forms of threats and abuse. The system of exploitation put in place in the logistics sector (which is by no means limited to this industry) is not only facilitated by employment through cooperatives, but it is further exacerbated by the fact that the workforce in warehouses and retail companies is mainly immigrant, and therefore subject to the constant threat of losing their permit to stay in Italy if unwilling to accept the employer’s conditions. In such a difficult arena for workers to affirm their rights, the determination of the warehouse workers has caught the employers off guard. Despite their tenacious opposition, many firms were forced to yield to the pressures of the workers and concede wage raises and improvements in the working conditions of their employees. During these years of struggles, not only have the workers gained confidence in their power and develop a net of solidarity among the different logistics hubs in the country, but also grassroots unionism – in the figures of SiCobas and ADL – has conquered a large segment of the industry’s workforce, in opposition to the downward negotiations of the main confederate unions. Thus, this time around, the renewal of the collective agreement (scheduled for January 2016) will pose some hindrance to the pressures of the employers. Despite the combined effort by employees and confederate trade unions to keep the grassroots unions away from the bargaining table, clearly the workers are increasingly building their own organizations, supporting representatives of SiCobas and ADL, and fighting back. Indeed, a new phase of struggle has just begun: on October 29 and 30, pickets and road blocks have brought warehouses and shipping companies in many cities to a standstill, mostly in the Northern areas that are the strongholds of the struggles, such as Bologna, Piacenza, Milan, and other towns in Lombardia and Veneto, but not only. The unrest has spread to cities such as Genova and Parma, which have joined the general strike for the first time. In Bologna the operations of the logistics center were stopped for the entire morning and follow by a march towards Yoox, a giant of the online retailing company that has been under attack since June 2014, due to the multitude of abuses – both economic and sexual – that its workers (mainly women) denounced. In Naples freight trucks and highways were blocked. Fercam, a multinational of logistics and transport that praises itself for ‘not even stopping over Christmas time’, was brought to a halt by picket lines in Rome. 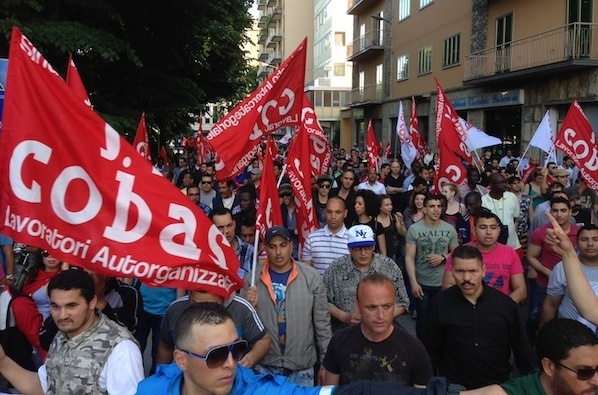 In some cases, workers met some immediate success: in Turin, the block by roughly 50 workers of Safim’s trucks has resulted in the reinstatement of the workers suspended after a previous strike and in the opening of a negotiating table on SiCobas’ right of representation in the company. In Stradella, a small town near Pavia, the striking workers won permanent contracts and the full application of the national collective agreement after refusing to break up a day-long picket line that hindered the activities of the cooperatives Planetario and Inticoop. Moreover, as Aldo Milani (SiCobas representative) declared in an interview for Radio Onda D’Urto on the day of the strike, the success of the action can be appraised in the prompt request by the major employers of the sector (TNT, DHL, SDA, Bartolini, GLS) for a meeting with SiCobas representatives to precede the official bargaining table with CGIL, CISL and UIL scheduled for January. These meetings – attended also by the association of the employers of the logistics sector (Fedit) - are happening as this article is being written. Something unprecedented has happened: an association of the employers has reached out to a grassroots union to discuss the renewal of the collective agreement. This was made possible by the strength of the struggle that has shaken the logistic sector, as the strike has showed. If so far the attempt has been to organize the resistance, now it is time to prepare the offensive. The platform laid out by SiCobas and ADL is simple: at the shopfloor level better wages and working conditions across all warehouses; at the political level, a battle against the combined attack of the government (through the Jobs Act and the ban to the right to strike) and the employers’ associations (through the end of the collective bargaining), which has been the apex of a process of flexibilization and precariazation of the workforce ongoing since the 1990s. At the surface, this battle may seem like a limited sectoral struggle, fighting against the corrosion of the CCN and for better wages in the logistics sector. Nevertheless, any interpretation of the conflict between the warehouse workers and the companies of the logistics sector through such a narrow perspective is to be half-blind: this contention concerns all of us. It concerns all of us because with each victory of the warehouse workers the employers are taken away the power to squeeze profit out of workers not only in the sites of struggle, but also at other levels of the supply chain. It concerns all of us because what happens in this industry is just a mirror of what is going on in other industries. It concerns all of us because in the context of the deep reorganization of labor relations under the Jobs Act, if we do not organize we will be increasingly vulnerable to threats and abuses. It concerns all of us because, as the warehouse workers have well understood in the course of their battle, ‘an injury to one is an injury to all’: the necessity to create a unified bloc against the employers is reflected in their political platform, which includes targets that matters not only to the workers in the logistics sector, but to the broader workforce and to the unemployed. First of all, the shortening of the working day is a crucial step that unites those who are out of work and those who work to exhaustion, 10-12 hours a day (these are normal working days in the logistics sector and elsewhere). We claim for the employment available to be redistributed: ‘Jobs for all, fewer hours, but don't take our wages down!’ (‘Lavorare meno, lavorare tutti, a parità di salario’) is our goal! This is an old mission of the workers movement, which cannot be further postponed in the face of unemployment levels up to 12% of the population and 44% of the youth. Job security and the safeguard of working conditions when a subcontractor is replaced by a new one is another demand that goes beyond the logistics sector, as the outsourcing of contract work is a widespread mechanism of employment of the labor force. In these cases, as the experience of the warehouse workers taught us, it is of pivotal importance to guarantee a stable employment relationship to the workers, who oftentimes fall victim to the changes in subcontractors, a common occurrence which results in the expulsion of part of the workforce in order to acquire new and cheaper one. Another theme that is central to the platform of the workers in strike and that speaks to a broader section of the workforce is the issue of workplace safety, health and the pace of work. This is a problem raised by many workers across industries, from the imposed weekend and night shifts to workers in many superstores to the impossible rhythms of the assembly line in the FCA plant in Melfi. To this end, we endorse the creation of mechanisms of control led by the workers themselves, in order to monitor the impact of work on people’s health. Moreover, at stake in this battle is also the right to union representation, which was put under question with the ‘Act on union representation’ signed on January 2014 and later on by the current government legislation on strike activity, which is now restricted in those sectors considered “essential” (it might help to mention that even museums and big trade show events are considered essential, and the definition might keep expanding). At the same time, the employers’ association Confindustria is working on dismantling collective bargaining in favor of a decentralized system of negotiation of labor relations. In this context, the struggle in the logistics sector shows that there are margins to invert the relations of force, to impose collective bargaining, to impose the interests of the workers when they organize. It is not a path paved with roses, this is a certainty. But who would have guessed that an industry mainly manned by immigrants under the constant blackmail of the permit to stay would have been the protagonist of the most offensive struggles of the recent years? In conclusion, the strike of the warehouse workers blends sectoral demands related to the renewal of the industry collective agreement and broader claims affecting the whole workforce and the unemployed. In the spirit of the slogan ‘an injury to one is an injury to all’, we encourage everybody to support this struggle. Originally from the Clash City Workers website.